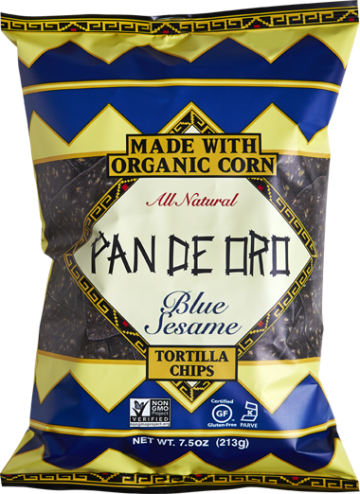 Stoneground organic Blue Corn, Sunflower Oil And/or Safflower Oil, Sesame Seeds, Sugarcane Fiber, Sea Salt. 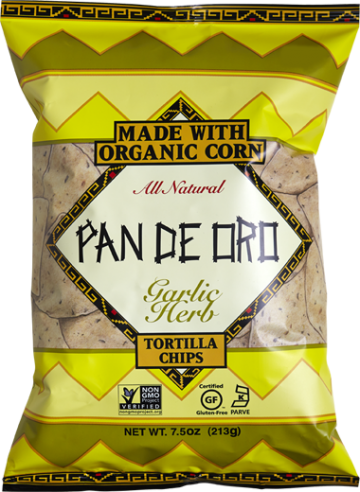 Stoneground Organic White Corn, Sunflower Oil And/or Safflower Oil, Sugarcane Fiber, Garlic Powder, Onion Powder, Spice, Sea Salt. Stoneground Organic White Corn, Sunflower Oil And/or Safflower Oil, Brown Rice, Flax Seed, Dehydrated Cane Juice, Sesame Seeds, Sunflower Seeds, Sugarcane Fiber, Quinoa, Navy Bean Powder, Sea Salt. Stoneground Organic White Corn, Sunflower Oil And/or Safflower Oil, Nacho Cheese Seasoning (whey, Salt, Maltodextrin, Buttermilk Solids, Cheddar Cheese, Natural Flavors, Tomato Powder, Deyhydrated Onion, Dextrose, Coconut Oil, Lactose, Dehydrated Garlic, Yeast Extract, Romano Cheese, Sweet Cream, Citric Acid, Spices, Lactic Acid, Extract Of Paprika, Sugar, Dehydrated Bell Pepper, Extract Of Turmeric, Sodium Caseinate), Sugarcane Fiber, Lime Oil. 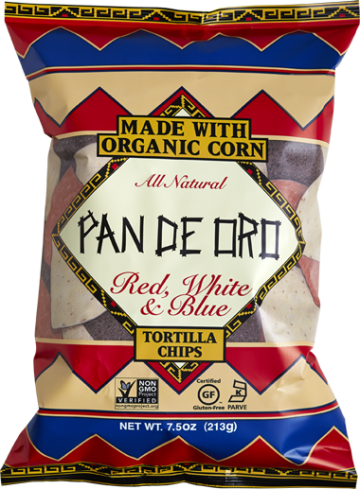 Stoneground Organic White Corn, Stoneground Organic Blue Corn, Sunflower Oil And/or Safflower Oil, Sugarcane Fiber, Beet Powder, Sea Salt. 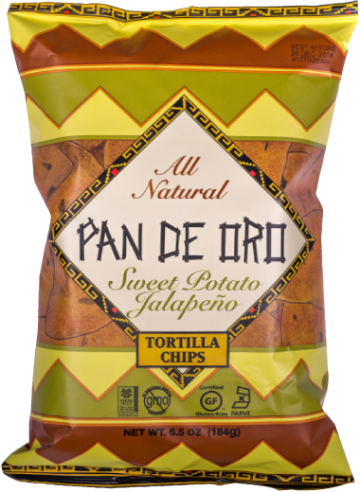 Stoneground Organic White Corn, Sunflower Oil And/or Safflower Oil, Sweet Potato, Sugarcane Fiber, Diced Jalapenos, Sea Salt. 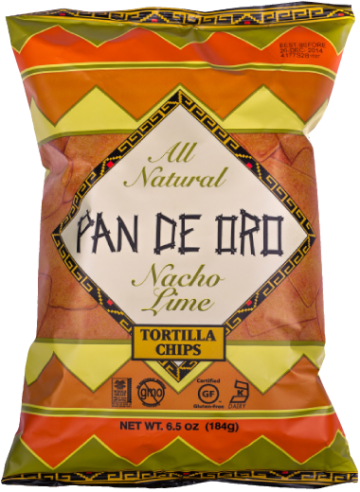 Are you planning a classic Southwest dinner? 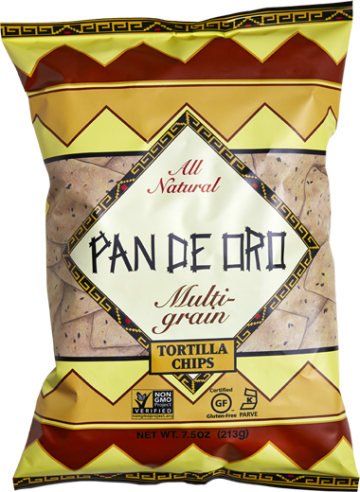 Match Pan De Oro's original White Corn Tortilla Chips with your favorite dish. 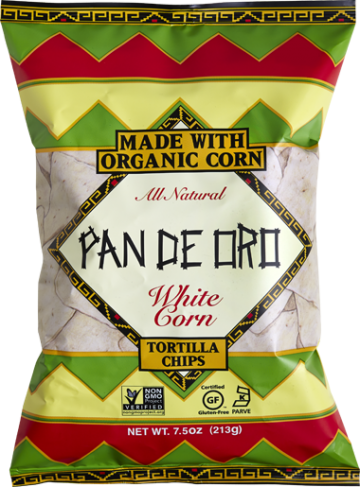 Stoneground Organic White Corn, Sunflower Oil And/or Safflower Oil, Sugarcane Fiber, Sea Salt.